The fact is, if drinking enough water is important for regular body processes and functions, you can guarantee that drinking enough water will be EVEN more important for women who are actively trying to get pregnant. First of all, your overall health is one of the most important factors in determining whether or not you will be able to get pregnant. By drinking enough water, you will improve and maintain your overall health, which is an important part of getting pregnant. Water helps your body function in all of its processes, ovulation, fertilization, and pregnancy included! Water supports a ton of reproductive processes as well. By drinking enough water, you can ensure that your uterus is healthy enough for an embryo to implant. If an embryo fails to implant, it can result in a miscarriage, so it is important to do everything you can to keep your uterus healthy and ready to carry a baby should you become pregnant. 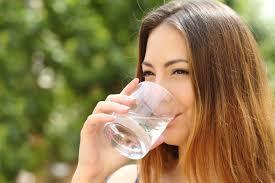 Drinking enough water can also help to increase your cervical mucus. Cervical mucus is very important when getting pregnant, since the cervical mucus is what the sperm attach to on their journey to the egg. Without enough cervical mucus, the sperm won’t survive and therefore won’t be able to fertilize the egg!